If you work in a school or college in the UK or Ireland, then you could get support to organise your own event to benefit yourself and other local teachers or technicians. By applying to the new Chemistry Teaching Event Empowerment fund, you could get up to £700 (€750) to fund your event and cover costs for your planning time. Your local Education Coordinator will also give you support to set up the event, allowing you to develop key leadership skills and get to know other local teachers to share ideas and best practice with. Read on to find out about the eligibility and criteria requirements for the fund. To apply, follow the link to the application form below. Should you have any questions about the fund, please email education@rsc.org, or contact your local education coordinator. Funding and support – what is available? Financial support – for event costs and up to one day of teaching cover for event planning. Up to £700 (€750) is available per application. Non-financial support – advice from your local Education Coordinator to help you organise your event, plus publicity through the RSC’s newsletters and social media channels. You can apply to the fund if you are a secondary teacher of chemistry or science technician in a school in the UK and Ireland. You must work at a school teaching chemistry to students within the age bracket 11-18. Your school will need to be signed up with the Learn Chemistry Partnership. Your proposed event will need to take place in the UK or Ireland. Please note that you don’t need to be a member of the Royal Society of Chemistry to apply. You can apply to the fund whatever stage of your career you’re at. We’d particularly like to hear from you if you work at a school facing challenging circumstances or in a rural area. Criteria – what sort of events get funding? That funding will enable you to run a new event. Or if the event has run before, funding will allow you to do something novel with it. That the event will be open to staff at local schools and free for them to attend. The event will benefit at least five teachers across at least three schools (please note we can be flexible here for very rural schools). The RSC can help with advertising the event to local schools. That the event will focus on improving the teaching of chemistry and/or fostering supportive, effective science departments. That you will evaluate your event to understand its impact. The RSC will offer guidance on evaluating the event. That your local RSC Education Coordinator will have an open invitation to attend the event so they can chat to attendees about how the RSC can support schools. A maximum of £300 (€330) can be used for teaching cover so that you can plan the event. If you would like to discuss your event idea before applying, please contact your local education coordinator. To apply to this fund, please fill out an application form. Please note the application form will take between 15 and 20 minutes to complete. You will need an idea of the event you would like to run, and a breakdown of the costs you would like the funding to cover. Have your say about science provision: are schools offering students equal learning opportunities? Join the Royal Society of Chemistry, Royal Society of Biology, Royal Society, Institute of Physics and ASE for this year’s Talking Science debate to discover the factors influencing schools’ decisions about science provision. These learned bodies share the desire to ensure that all students have equal opportunities to continue studying in the sciences up to the age of 16 and beyond, and their recent research aimed to identify common timetabling models and the extent of their use, processes used to allocate students and teachers, and the extent to which schools are using potentially problematic timetabling models. Anecdotal evidence suggests that timetabling and other curriculum-related constraints are influencing schools’ decisions about different routes through the sciences at 14–16. These constraints impact on, for example, the distribution of science teaching between specialist and non-specialist teachers in school, with consequences for student experience and outcomes. Chairing the discussion is the Royal Society of Chemistry’s Education in Chemistry board member, David Read, with panellists including the Royal Society of Biology’s head of education policy, Lauren MacLeod and the Inspiration Trust’s subject specialist leader for chemistry, Lucy Austin. 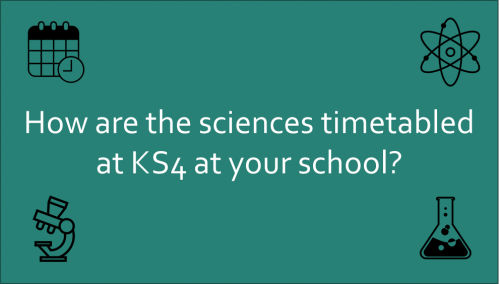 Be a part of the discussion potentially shaping schools’ decision making about science timetabling, and ultimately students’ choice about their science education. This debate could inform decision making not only in schools, but at policymaker level too. Join in to provide your students with the best opportunities to fulfil their scientific potential. Join us at the ASE conference in January to get new teaching ideas for your classroom, support your department and join the conversation for science education. The ASE Annual conference, held at the University of Birmingham in 2019, is the largest science education development conference in Europe. We will be there from 9-12th January to support all teachers of chemistry, whatever your specialism. How you can bring the International Year of the Periodic Table into your classroom through new activities. How you can help to shape our products and services for teachers. What support we can over you to enhance your teaching and support your whole department. We will also be running consultancy conversations to discuss how the RSC can support you to improve your chemistry teaching or build an effective science department. Register now for a time slot and tell us what topics are most important to you. On the day, we’ll discuss these topics with you and show you how our resources and services can support you. Take the opportunity to contribute to our development of a vision for the chemistry curriculum. We’ll be debating some of the key topics identified in our consultations so far, asking you to think about things like curriculum size, progression and assessment. Framing the sciences — what makes a scientific discipline? Discuss the nature of scientific enquiry across the different sciences and how we can characterise the individual sciences, whilst also highlighting the common approaches. You will have the opportunity to contribute to our proposals for improving curriculum in the sciences and move on from suggestions of a single ‘scientific method’. What makes a great science department? Join us for an interactive panel discussion, with ideas and practical steps to help you develop a vibrant, effective science department. Our experienced panel will share some of their own insightful learnings and recommendations, before a wider discussion where we want you to contribute your own ideas and experiences. Whether you are a newcomer to science teaching or an experienced leader, this event will offer inspiration and ideas to help you power up your science department. Drawing on the experience of a magazine editor, a science journalist and a science teacher who writes professionally, this session will give you the benefit of three perspectives on science writing and reveal how media professionals create compelling science stories. Learn how to engage people with science, spark their curiosity and keep them coming back for more. Discover how editors choose and package stories, get tips from a journalist and author on how to hone your own writing, and share in the experience of a teacher who has developed science writing as part of her career. If you’re at a Learn Chemistry Partnership (LCP) school, you’re eligible for a 25% discount on conference tickets from Wednesday – Friday. To get the code, just drop us an email with your school name. Or fill in this form to sign up LCP. How are the sciences timetabled at KS4 in schools? Take part in our online survey exploring models used for timetabling of the sciences at GCSE. The Royal Society of Chemistry is working with the Association for Science Education, Institute of Physics, Royal Society, Royal Society of Biology and Shift Learning to gather feedback from those who have a strong knowledge of how the sciences are timetabled at GCSE level schools in England. Your feedback will directly feed into our education policy work. Take part in a ten minute online survey with a prize draw to win £250, to help us understand the variety of models used by schools in England to teach the sciences at GCSE. We would appreciate it if you could take the time to complete the survey, or pass this on to an appropriate colleague, teacher or school contact. Are you a teacher or technician at a Learn Chemistry Partnership (LCP) school? If so, we are delighted to announce that during the Autumn Term of 2018 we have a Bursary Scheme running which will support LCP teachers and technicians to attend workshops and courses delivered by our team of regional Education Coordinators. This knowledgeable, locally based team offers advice and support on teaching and enriching the chemistry curriculum as well as face-to-face workshops and professional development courses on topics and areas of local interest. Bursaries of up to £50/€60 for travel expenses and up to £200/€220 for full day cover costs are available for selected events. Email your Education Coordinator to find out whether any LCP events are eligible in your region! If your school is not yet signed up to the Learn Chemistry Partnership, then it’s not too late. Simply fill in the registration form here. As well as regional workshops, you’ll also get access to a wide range of resources to assist in your teaching, such as Education in Chemistry magazine and a 50% discount on our online professional development courses. Please note that bursaries will only be available to LCP teachers and technicians until the end of 2018. Bursary claims for are limited to one claim for travel and one claim for cover per person during this period. Local conditions may apply, so please speak to your Education Coordinator for further details. Bursary costs must be claimed within 28 days of attending the LCP event so to ensure that your claim is quickly processed please get a letter from your Principal confirming the costs of your cover, then attach it to your completed Member/Non-member Expense form before submitting it to your Education Coordinator. You can submit a separate expenses form for your return travel (attach receipts and/or details of mileage) or alternatively have all the information on one form and have your school reimburse you for travel costs. In late 2017, we commissioned some research to find out more about what science teachers and technicians across the UK and Ireland thought of the help they get from the Royal Society of Chemistry. We also wanted to know what they want from us in the future. If you were one of the 500 who responded, then thank you. Your insights have helped to tell us what teachers’ and technicians’ main concerns are and what we can do to help. From the support we already provide, many of you told us that you find Learn Chemistry and Education in Chemistry useful — especially to support practical work. We’ve been working hard recently to make sure both of these provide information that’s easy to apply in the classroom. Lots of you spoke about wanting it to be easier to find resources that are linked to the new specifications, particularly due to the recent curriculum reforms in the UK and Ireland. We’re now working hard to find ways to address this. Those of you who had been to our local events found them useful. However, many people who replied didn’t know about them. Due to this feedback, we’ve recently changed the look and layout of your regional newsletter. We hope that this makes it easier for you to find out about and register for local events. We also found other areas where we can improve. You told us you want more clarity about the exact purpose and benefits of Learn Chemistry Partnership (LCP), and what you should do once you’ve joined. We’re busy planning how we can ensure that LCP provides benefits and support that will really help you to inspire your students in chemistry. We’re also planning to introduce online features for LCP that will make it easier to find our support. We want to continue to get your input into these ideas, so in May this year we asked you to help test some of our early plans for these new online features. We had an enthusiastic response to our request for help, so thank you if you were one of the people who volunteered. You gave us some great insights about how to make things clear and easy to use. It’s still early days for these developments, and we’ll be asking for more of your feedback as we go along. If you’re interested in helping us test the new service, please get in touch. We’re making improvements to our schools network, Learn Chemistry Partnership (LCP). To make sure we create a service that provides support which is truly meaningful, we’re looking for feedback on new ideas for creating an improved web experience for our partner schools. If you’re a teacher, technician, or work in a school, we’d love to hear from you. To take part, we’d need to speak to you for about an hour at a time convenient to you between now and the end of May. There’s no need to travel — you’d just need access to a computer with an internet connection, a speaker and a microphone. By taking part, we’ll ask you to try out some of the new online features we’ve got planned, giving you the opportunity to experience and give feedback on exciting new developments for LCP. This is a great chance to help us shape the service we deliver to you. As a thank you for your time, you’d receive a £20 Amazon gift voucher. If you’d like to take part, please get in touch. Over the past few months, we’ve been checking the health and safety guidance in some of our most popular demonstrations and class practicals is up to date, and we’ve now published those changes. The procedures in our Classic chemistry experiments, Classic chemistry demonstrations and Chemistry for non-specialists books are known and loved by many chemistry teachers, and many have been freely available on Learn Chemistry since 2012. We’ve collaborated with SSERC (Scottish schools education research centre) to check these procedures and guidance notes, and have made improvements to match the latest best practice and policy. We’ve now published updated versions of these practicals on Learn Chemistry. Use them with the confidence that you are accessing the most up-to-date versions of these classic procedures. We’ve removed some supporting videos, and three experiments outright, because it wasn’t possible to update them sufficiently in their current form. For example, the Screaming jelly baby has taken a temporary holiday from Learn Chemistry. However, we will publish alternatives or updates to these in the coming months. Our health and safety work is on-going. We recently updated our popular Nuffield practical chemistry collection, and we’ll be checking more of our practicals over the coming months. This year, we’re reviewing and editing 200 practical resources. If you want to know more about our work to maintain over 2,000 teaching and learning resources, email learn-chemistry@rsc.org. Explore our refreshed Classic chemistry experiments, Classic chemistry demonstrations and Chemistry for non-specialists collections. Over the last few months we’ve been doing some development work on Learn Chemistry and some of our other educational sites. This has ranged from small fixes to new features like the more prominent download box for editable resources. The latest changes include a refresh of the site’s look and feel, as well as some changes around how to use the site. The visual refresh isn’t solely cosmetic, although part of the aim is to make the site feel less dated. Based on feedback and user testing, it includes some simplification and de-cluttering that make the site easier to use. The search bar is now more prominent. It’s the main way the site is used, and we want to make sure it’s easy to find. We’ve removed a number of items on the page that weren’t used much and/or confused users: The “Teachers, Students, Higher Education, News” panels, the social sharing buttons (Twitter, Google Plus etc), and the resource counter. We’ve removed the Browse Resources control. Testing and feedback suggested that most users thought this was a search filter, and it wasn’t used much. Removing it focuses the page on the search box and highlighted resources. We’ve simplified the design visually. Cleaner lines, more spacing, and less on the page make the page quicker to navigate, and the highlighted resources more prominent. Learn Chemistry used to have multiple navigation menus. These were confusing and took up valuable space, making the site hard to navigate on mobile devices. We’ve replaced these with a new navigation menu at the top of the site, which is designed to be more mobile friendly. The new top navigation bar retains most of the elements of the existing one, and replaces the links to other RSC sites. This also removes the other search box which searched across all RSC sites, and caused some confusion. The new visual design on the home page removes the coloured background and makes the menus smaller. This has also been rolled out across the rest of the site, and most of the sub-sites. We hope you like the new design, and look forward to hearing your thoughts and feedback. Discover the support you need on our stand at the ASE 2018 annual conference in Liverpool. Specialist or non-specialist, from career development to classroom resources, we’ve got something for you. Visit the exhibition (it's free!) and find all of the support we offer, including hands-on activities. Discover Education in Chemistry’s new series of science articles with classroom-ready teaching resources: engaging activities for your students in new, cutting-edge contexts. Try out a magical classroom resource from one of our professional development courses. Designed to help you reach the next level wherever you are in your teaching career, our courses give teachers an in-depth understanding of key concepts in chemistry. Find out how to help your students understand core ideas, tackle tricky topics and avoid misconceptions. Uncover what’s new with Learn Chemistry. It’s now easier to search and find what you're looking for. Take a look at our new resources, download them as Word documents and edit them to suit your classroom. We look forward to meeting you in Liverpool! Planning on visiting our stand? Sign up to the Facebook event. Stay up to date with Education in Chemistry's live coverage of the ASE annual conference.